I came across a handy little application called DiffMerge that allows you to compare multiple files and make changes while open. This is extremely useful when comparing multiple MikroTik configuration files. Previously I used sdiff, but I think this is much easier to use. 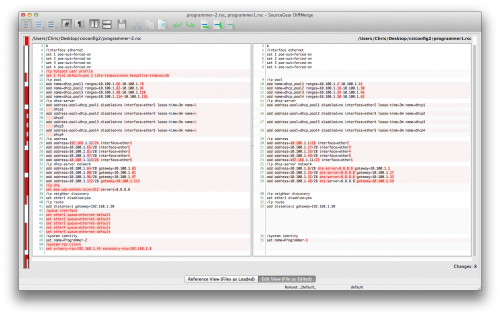 DiffMerge is a free application and can be used on OSX, Windows, and Linux. The download can be found here.